In a world that is reigned by snippets and 140-charachter Tweets, the magic of books is sometimes forgotten. Fewer and fewer children enjoy reading, and the explosive rise of smartphones and tablets, shown on this graph, has resulted in diminishing literacy rates. Books are magical. Books take you across continents and back in time. They offer insights, impact your emotions, and inspire you to take action. The right book will always keep you company. 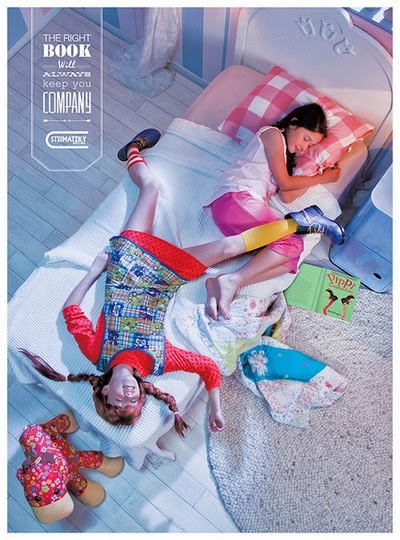 Israeli bookstore chain Steimatzky recently recruited advertising agency ACW Grey, Tel-Aviv to promote books and reading. Via a series of simple and literal print and video adverts, which show readers sleeping next to their favorite literary characters, ACW communicates the special relationship that can develop between readers and books. You can check out all the visuals here.